I have all sorts of bias when it comes to Bar Mitzvah Boy: my friend Lara Stubbs stars (as the somewhat spoilt, Jewish princess older sister of bar-mitzvahed boy in question); the show is directed by Stewart Nicholls, with whom I worked last summer on Robbie Sherman’s Love Birds; and it’s produced by the indefatigable Katy Lipson, who I also consider a friend (and fellow occasional exile to Mallorca). No surprise then that last night’s opening was a night of many selfies with those and other friends in attendance. And maybe no surprise that I’m going to tell you I enjoyed the show immensely – but I did. I was raised Protestant and have never been to a Bar Mitzvah – “You have now!”, a Jewish gent at the interval told me. The rituals of both the service and the family dynamics (and all-round kvetching) leading up to it are highly accurate, so he assured. And I believe him. I was raised Protestant and have never been to a Bar Mitzvah – “You have now!”, a Jewish gent at the interval told me. This story, set in north London in the 1970s, has oozes authenticity which, while rooted in the specifics of Jewish life and traditions, rings universally true because we all remember the feeling, and the fear, of ceding our childhood innocence to adult responsibilities – and the lifelong trials and tribulations of being part of a family. The star-dust smattering at Thursday’s opening – including lyricist Don Black and actress Maureen Lipman, widow of the original teleplay’s late author Jack Rosenthal – also served as a reminder of Bar Mitzvah Boy’s intriguingly checkered past, which director Stewart Nicholls explains in his programme note below. I also saw the 2011 Menier Chocolate Factory revival of Rosenthal’s play Smash!, about the process of Bar Mitzvah Boy flopping. I’m glad that Stewart and the team have been able to give the Boy a new lease of life – maybe next up they’ll need to revive, and rewrite the ending of Smash!, to take account of this musical’s change of fortunes. 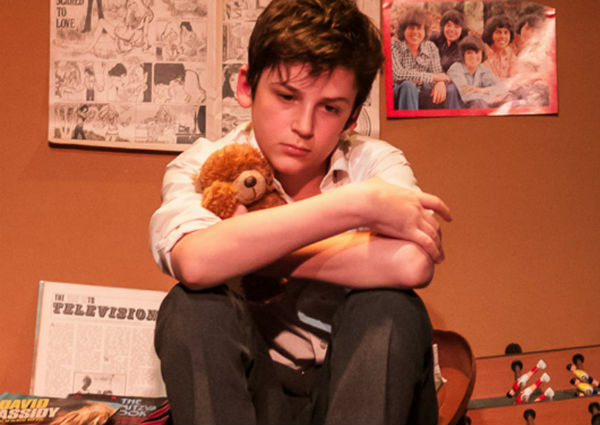 Bar Mitzvah Boy runs Upstairs at the Gatehouse in Highgate, north London until 10 April 2016. Also read the four-star review from My Theatre Mate colleague Jonathan Baz (who’s gone through three Bar Mitzvahs – his own and his two sons’). Why did the original only run for 77 performances? The musical of Bar Mitzvah Boy has always intrigued me. What a writing pedigree: Jule Styne, Don Black and Jack Rosenthal! I was too young to see the original 1978 London production, but never tired of listening to the tuneful songs and witty lyrics on the original London cast album. I also loved Jack Rosenthal original 1976 TV play, so I wanted to find out more about the musical. Why did the original production only run for 77 performances? Why did an off-off-Broadway Americanized version quietly disappear in 1987? Why had the piece never seen another production? With such wonderful source material and a high calibre of writers, surely the piece needed to be considered again? Approximately twenty years ago, I contacted Rosenthal’s literary agent with a request to read the script of the musical. A script didn’t arrive, but my phone rang and it was Rosenthal himself, who humorously explained why he didn’t want the musical to be seen on stage again. In short, he didn’t care for Martin Charnin‘s direction of the London production, he didn’t get on with Styne, and felt that his intimate tale of a boy running away from his Bar Mitzvah had got lost in the slick ‘Broadway style’ show that was produced. He even wrote a play loosely based his hateful experience entitled Smash! – and more lively tales are found in his delightful autobiography. I presumed that the show wouldn’t see the light of day again, until I heard about a new version with a revised script by David Thompson that had a one-off workshop reading in New York in 2007. David is highly regarded for his masterly revisions of lesser-known Broadway musicals, so is the perfect man to study all the materials available in order to fashion a new script drawing on Rosenthal’s original TV play. Some songs had been written for the off-off Broadway production in 1987, so these were considered along with the original 1978 London score when creating the new version. Don Black was allowed access to unpublished Styne melodies, for which he wrote many new lyrics, in order to have new songs that would flesh out characters, forward the plot and explore Eliot’s story. David Loud created new piano/vocal arrangements for the workshop, in order to bring the songs together to form a whole score. It has been like working on a brand new musical – which is always an exciting and exacting experience! Don has always known I’ve been interested in the show, and showed me David Thompson‘s revised script and the ‘new’ songs. I thought it had great potential, and bought it to the attention of Katy Lipson, who came on board to produce the show and we decided that Upstairs at the Gatehouse was the perfect intimate venue in the ideal location to tryout this new version of the show. I have rediscovered a few British musicals from obscurity, and so, together with orchestrator Richard Healey, we have taken the workshop script and score and brought it to the next level of a full production. It has been like working on a brand new musical – which is always an exciting and exacting experience! With the blessing of the Styne and Rosenthal estates, and together with David Thompson and Don Black – the busiest man in show-biz! – we have now been able to work on the revised version to create an intimate production that dispenses with extraneous characters and unfocussed production numbers and, most importantly, places the story of Bar Mitzvah Boy Eliot Green at the forefront of the piece.